In a surprise move, the UAE government has announced the implementation of Value Added Tax (VAT) on all food items. VAT will be implemented in UAE and Saudi Arabia from 1st of January 2018. Saudi Arabia has also decided to impose the tax on food items. The other GCC countries will also impose VAT in coming months and they will decide on their own about the implementation of tax on various items. Previously, it was told that necessary food items will be exempted from VAT or will be zero rated but the recent announcement has overturned the previous announcement. According to projections, this new decision will increase the cost of living in the county by 2.5% after the introduction of VAT in 2018. According to other reports, water and electricity will also be taxed. The recent announcement was made by DG of FTA (Federal Tax Authority) on Wednesday 8th November 2017 in which he clearly stated that food items will not be included in the list of products that are exempted or zero rated from VAT. This recent statement is completely different from the stance taken by undersecretary of Ministry of Finance in 2015 when he declared that more than 90 necessary food products will be zero rated from the upcoming tax. The recent announcement will impact all the citizens and residents of UAE but the standard tax rate is just 5% which is quite low as compared to most of the other countries of world. Due to this low rate, it is expected that common people and businessmen will accept the tax without much worry. The UAE government is expecting to generate around AED 12 billion in the first year and AED 20 billion in the second year after implementation of VAT. It will help the country to stable its economy which is facing pressure after continuous decrease of oil prices in international market. Implementation of VAT is one of the several steps that are taken by UAE in order to decrease its reliance on oil and diversify the economy of the gulf state. The situation is less alarming for UAE as compared to most of the other GCC countries as UAE is already progressing non-oil sectors like tourism and business. 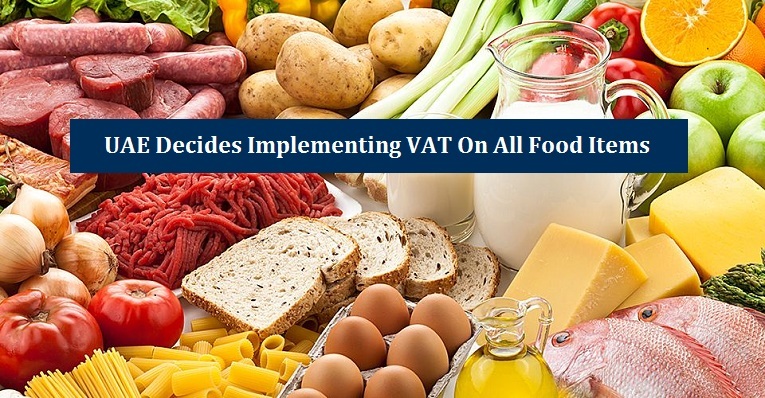 The other GCC countries will decide whether to implement VAT on food items or not at the time of implementation of the tax in their countries. It is expected that all the other GCC countries will also apply VAT in 2018. If you are living or doing business in UAE and concerned about the impact of VAT on your daily life or business, then you can contact Riz & Mona Consultancy for free consultation. Our WhatsApp # is 971-56-9971225.